I’m restoring my reading quilt, which I introduced to you guys in this post. I discovered something really cool when I started cutting the blocks out. I thought that this lumpy quilt was just the three layers: top, batting, and backing. I assumed that the batting was lumpy because it was poor-quality polyester which was commonly used when this quilt was made in 1991. I was wrong. Here’s what I found underneath the first block. Huh. Interesting. There’s another quilt in there! It’s degraded to the point that the fabrics are thin and literally falling apart. There’s hand-embroidery across the block as well as ties. Here’s what it looks like after I’ve cut out all of the reading blocks. There’s a crazy quilt under there! It’s completely done by hand with large pieces of fabric and large hand embroidery. You’ll notice that some of the borders are still there. That’s because before my current plan of restoring the quilt by reusing the blocks, I tried to add some quilting and save it that way. I didn’t get far with that plan before deciding it wasn’t the way to go. Here’s a closer look at some of the embroidery. I wanted to see if there were any surprises hiding under the backing fabric, so I cut into that. Nope, looks like the backing is original to the crazy quilt, as it’s attached to that. The stuffing is completely falling apart, as you can see. I did a burn test on the batting to see if it’s synthetic or natural. Since it caught fire right away, instead of melting or curling away from the flame like rayon and polyester it’s a natural fiber. Probably cotton or wool. 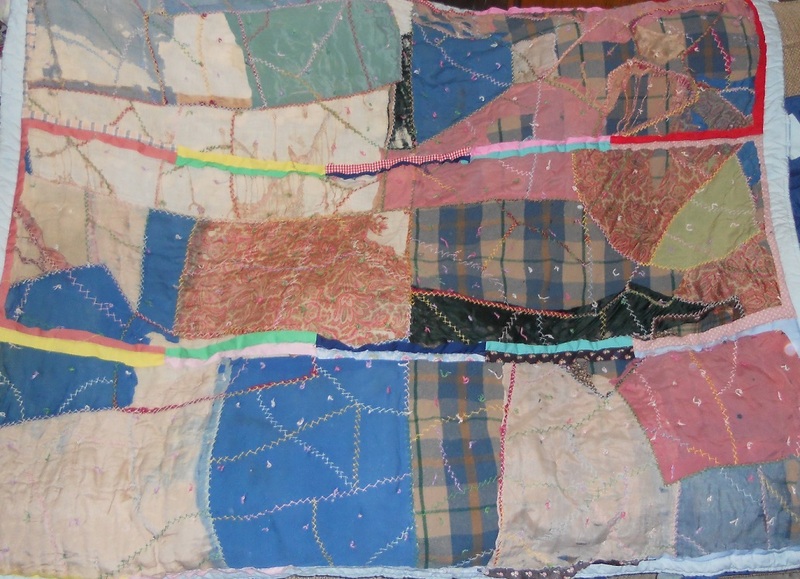 Here are my top two theories on the history of this crazy quilt. We may never know for sure. First, it could have been made by maternal grandmother. 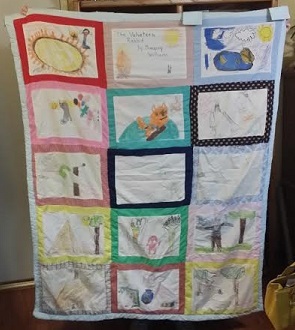 She started a cathedral window quilt that includes fabrics from Mom’s communion dress, Papa’s handkerchief, Grandad’s shirt, and more. (Read more about Papa here.) But she never finished it. The story is that she liked the idea but hated sewing it so it was a UFO (unfinished object) that Mom completed when she learned to quilt. Now it’s a family treasure. Maybe she made the crazy quilt before starting the cathedral window, which is a much more difficult project. Second theory. My Dad’s grandmother (Gigi to me) was a healer. Sometimes people bartered for her services instead of giving money. She might also have sewn herself, I don’t really know. Anyway, when she died our family found a stack of beautiful, hand-sewn quilts. None of them had labels so we didn’t know who the makers were. Mom was given some of those and maybe this one, which has clearly been falling apart for a very long time, was re-purposed that summer that I learned to love reading. Some others of Gigi’s quilts are still out there somewhere, intact I hope. 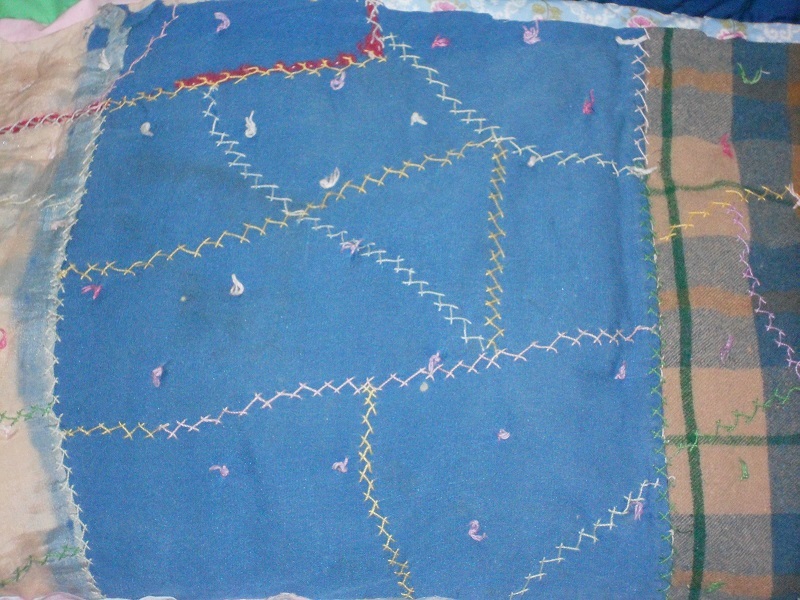 I learned to quilt with my Mom. After she died, it was too painful to do it without her for a long time. Besides, I was a teenager who wanted to spend her time at the movies, mall, and finding a boyfriend. So her fabric stash, rulers, and other supplies were given to her quilting friends. Over time other things were given away too, including those unknown quilters’ art. 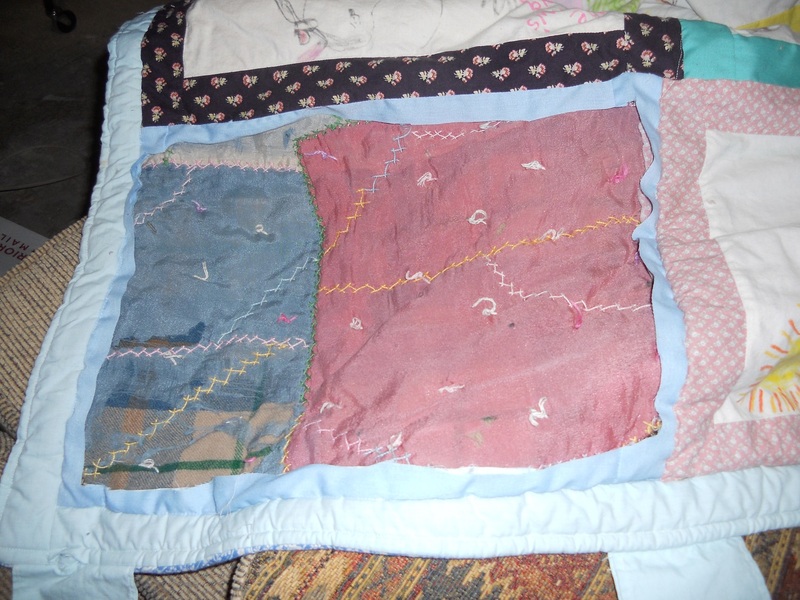 I came back to quilting about five years after Mom’s death… to make a Christmas present for my cousin Jade. I am an artist, and fabric is a great medium to express that. Plus, sometimes, it makes me feel closer to my ancestors. This entry was posted in Artist's Studio, Collaborations, Embroidery, Inspiration and tagged Antique Quilts, Batting, Cathedral Windows, Crazy Quilt, embroidery, Family, Gigi, Heirloom, History, Inside the Quilt, mom, Papa, Reading Quilt, Restoration on March 21, 2014 by quiltartbymegan.